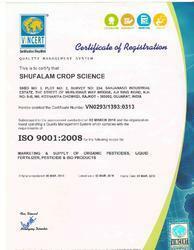 Shufalam Crop Science is established in 2011, is an ISO 9001:2008 certified is the prominent Manufacture of Bio Pesticides, Pesticides Products, Growth Promoters and Organic Fertilizers etc. Our wide ranging agro product serve the people in different Indian state and spread across its districts through an extensive distribution network of loyal and supportive dealers. Our company's prime motive to offer highest standards concerning the quality of our products, to imbibe unbeatable quality into our product. For this we have employed a team of quality control inspectors that inspect our product through each state of production process. They carry out regular quality control test, starting from the stage of procurement of raw material till the delivery of finished products. Owing to the meticulous efforts of our team, we are able to expand our business worldwide. Managed by Mr. Hasmukh Patel, we have been attained a remarkable position in this domain. Again we have introduced new product to meet the growing need of our farmers. There product have helped in rich yield and bountiful harvests. Our vast experience and extensive research in agriculture product has meet the global challenges. We are also known for recognizing the need eco friendly products like Bio Doxa , Antique, Lancer, White King, Which will help the farming society in the long run. Shufalam Crop Science provides its grower clients with highly trained and professional field crop consultants to monitor crops on a regular basis by organizing R & D programs time to time . Our personnel has expertise with a wide variety of crops: strawberries, rice, field corn, sweet corn, tomatoes, peppers, lettuce, citrus and many other fresh market crops. The goal of our scouting service is to give the grower the most useful and accurate assessment of insects, disease and fertility status of the crops. Our research and development laboratory is fitted with technologically superior testing equipment and this unit is manned by a team of dedicated and qualified researchers who put in their best effort in the development of new plant nutrients. We are a research oriented organization with prime focus on development of innovative and better plants nutrients, which are used to enhance the productivity of crops. They also assist us in formulating our range of products in environment friendly process. Our research and development team is in constant touch with the farmers and cultivators so as to know the exact problem they are facing in the cultivation process and to suggest appropriate solution for it. They carry out various experiment to come out with solid conclusions from the experiments. We have established a state-of-the-art infrastructural set up that is furnished with modern tools and machinery. This ultra-modern infrastructural unit helps us in processing our products in accordance with international standards. In order to ensure smooth and systematic flow of the entire work process, our infrastructure is categorized in to several parts such as processing, quality control, production, procurement, sales & marketing, etc. Each department works in close-coordination with each other to manage the processing process in a systematic manner. Due to our vast industry experience and knowledge, we are actively engaged in providing supreme quality Bio Pesticides, Pesticides Products, Growth Promoters and Organic Fertilizers etc. With the support of our skilled team of professionals, we are providing a high quality range of products to our clients within the provided time frame. The offered products are processed using cutting-edge technology and quality tested chemical compounds under the supervision of our skilled professional. Our dedicated professionals also work in close-coordination with each another in order to deliver the high quality of products to our valuable clients. In addition to this, we organize important workshops and training sessions to upgrade their knowledge and skills.